Do we have to sort the cartridges before sending them in? NO. We will do that for you when the cartridges arrive and send you an itemized list of exactly what cartridges you sent. We do ask that you remove the cartridges from their original boxes and packaging. Are there any up front or hidden costs to participate in the program? Absolutely not! We do ask that you and your organization be committed and willing to put forth the effort needed to implement the program before requesting any collection stands. How many collection stands can we get? One per organization until you send in a box of empty cartridges exceptions can be made depending on the situation. 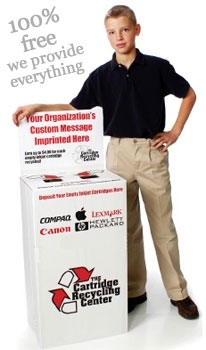 You can ask The Cartridge Recycling Center support staff for help regarding any unique situation you may have. How many cartridges do your "Insert / Holding" boxes hold? How long does it take for the "Insert / Holding" box to fill up? It depends on the location and how successful you are at spreading the word throughout your community. Do you accept Toner/Laser cartridges with this program?